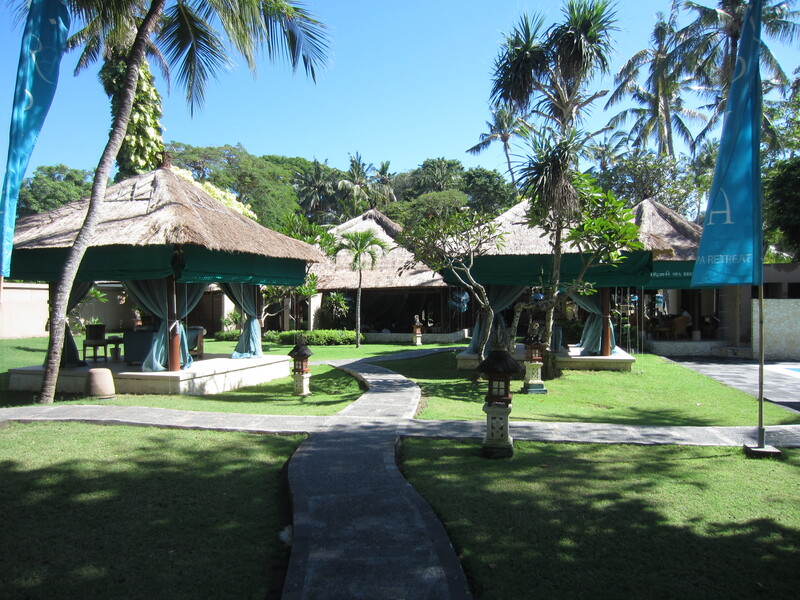 It was indeed time for a relax, and that’s exactly what we got here in Sanur, on the east coast of Bali’s south. Good food, long easy days, lots of sunshine. I didn’t have the motivation for a sweaty, mosquito-bitey, smelly dormitory backpacking adventure. We were in the right place. Sanur’s curved beach was cluttered with huge, wooden, rainbow spiders. More rainbow spiders were bobbing and listing in the calm ocean. These pretty little fishing catamarans brightened up the already tropical scene, each with red and green and blue outriggers, and painted eyes. Sanur had a beach perfect for walking from one end to the other. The locals occupied some parts of the beach, families playing with inflatable toys in the surf. 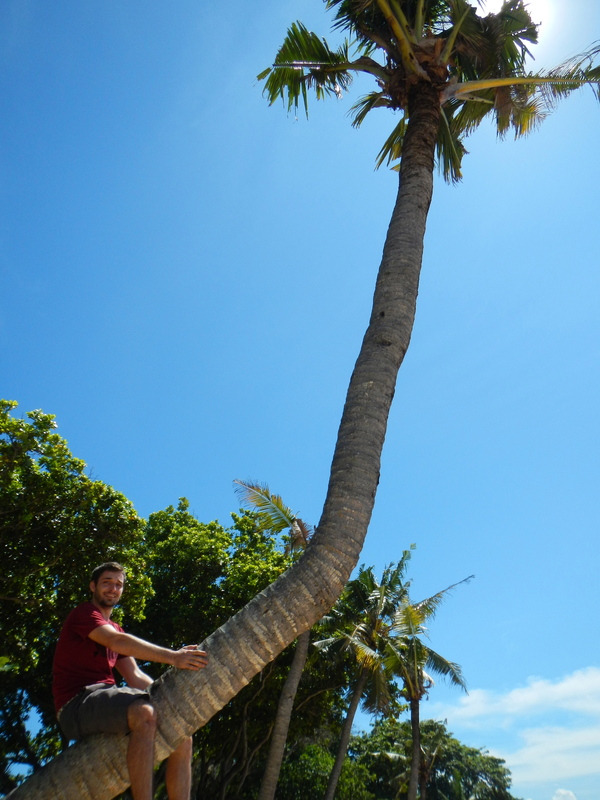 There were empty stretches of palm trees, sections with Balinese clothes stalls and souvenir shops and mouth-watering barbeques, and parts with solo travellers escaping the crowds by reading books on sun chairs. Then there were the ‘luxury’ sections, with massage parlours, comfortable cushioned loungers under umbrellas, and waiters serving mojitos. 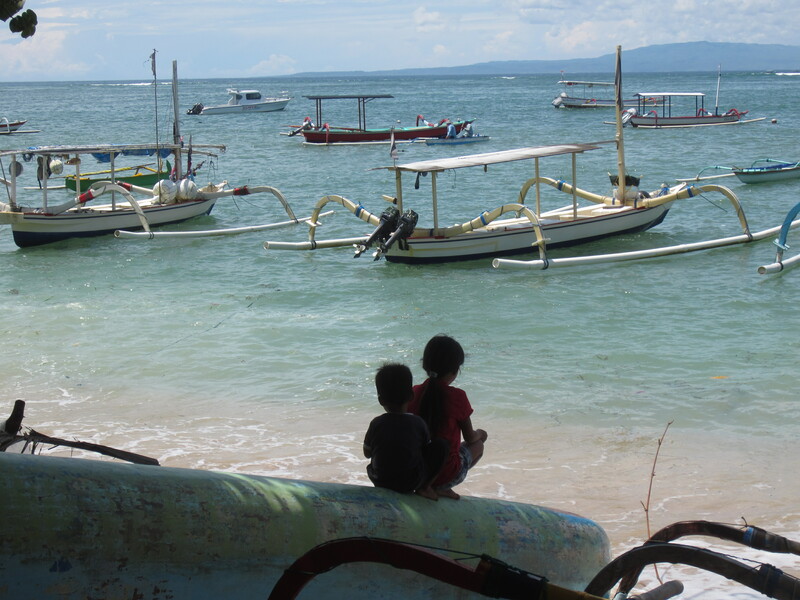 What Sanur didn’t have were relentless touts, and young travellers looking to hit the beach by day and the club by night. It wasn’t really about bars and nightclubs in this part of Bali. 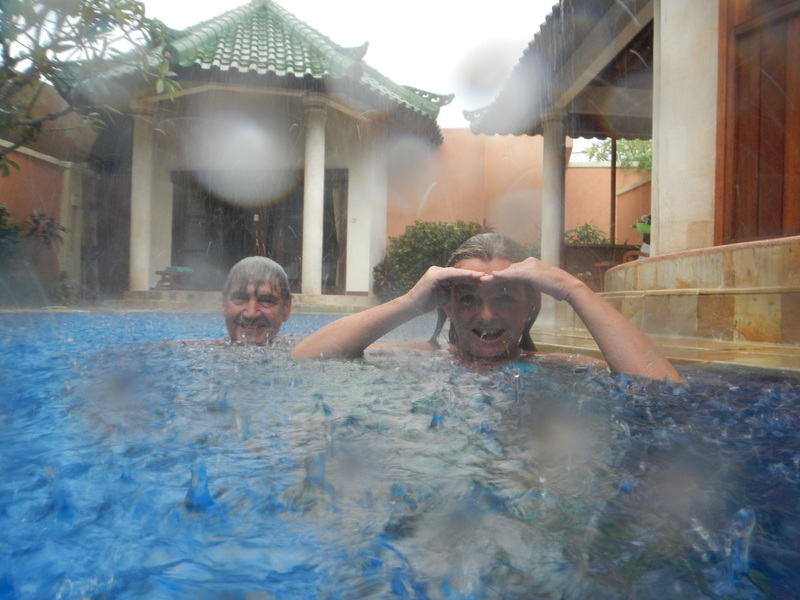 It was more like villas and luxurious hotels. It’s high-quality restaurants allow you to enjoy Bali’s food without having to worry about ‘Bali Belly’ creeping in through a dodgy mee goreng. This is a place for retirees and families to work on their tans. 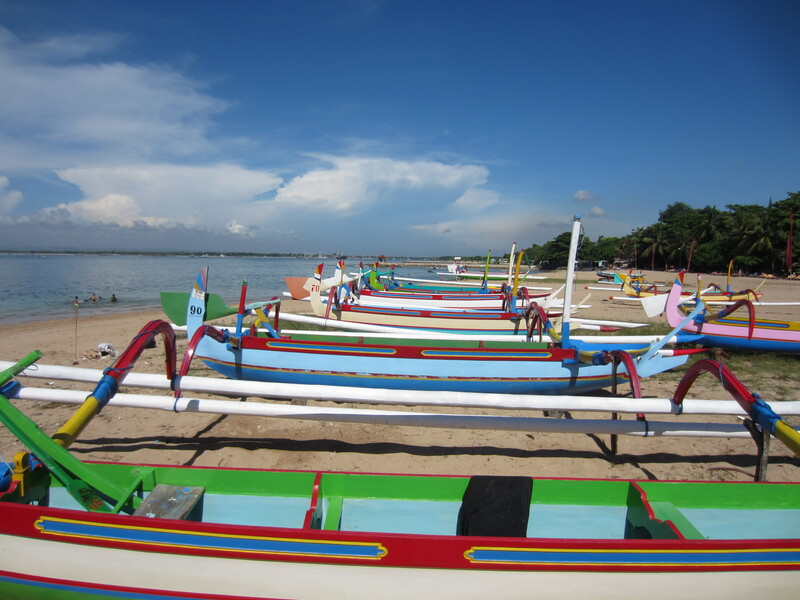 Even if it seems a little too quiet for your taste, Sanur is pretty likeable. The long main roads (where blue taxis inevitably honk at anyone who isn’t Indonesian) are cool places to grab an ice cream, watch your step (Hindu offerings, parked motorcycles and gaping holes in the pavement make each sidewalk an obstacle course), and watch the madness of this cool place in South East Asia. 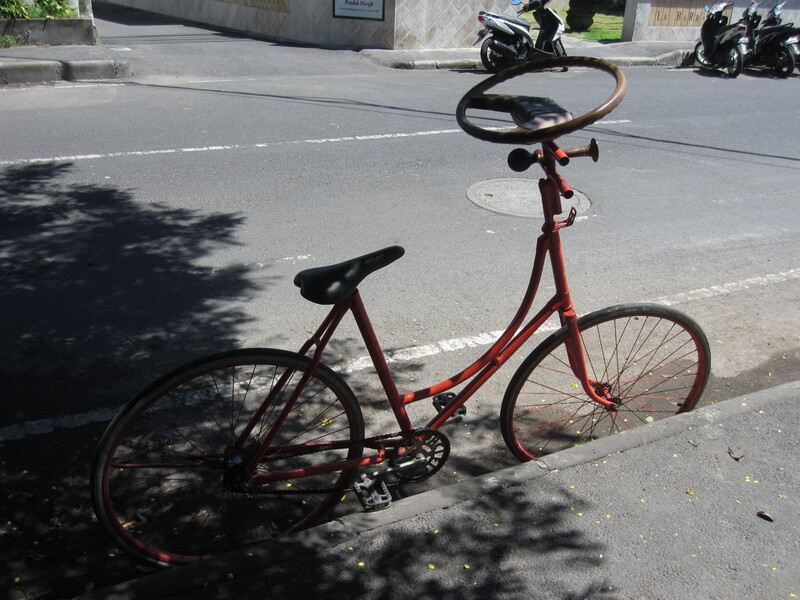 A bike with a steering wheel and old timey horn. That’s just the kind of weirdness I was hoping to find! Time to act like a kid again! I was just in Sanur a couple of months ago. It’s definitely so much more mellow than Kuta. And it’s definitely home to some great hotel deals. I paid around $25 USD for an amazing traditional Balinese room (with a pool)! Yeah it’s great, one of my favourite places in Bali! I love your article!!!!! I feel like like I forgot so many little things! Keep writing!